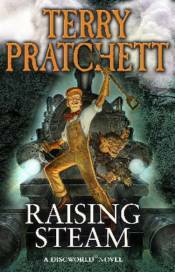 To the consternation of the patrician, Lord Vetinari, a new invention has arrived in Ankh-Morpork � a great clanging monster of a machine that harnesses the power of all of the elements: earth, air, fire and water. This being Ankh-Morpork, it's soon drawing astonished crowds, some of whom caught the zeitgeist early and arrive armed with notepads and very sensible rainwear. Moist von Lipwig is not a man who enjoys hard work � as master of the Post Office, the Mint and the Royal Bank his input is, of course, vital . . . but largely dependent on words, which are fortunately not very heavy and don't always need greasing. However, he does enjoy being alive, which makes a new job offer from Vetinari hard to refuse . . . Steam is rising over Discworld, driven by Mister Simnel, the man wi' t'flat cap and sliding rule who has an interesting arrangement with the sine and cosine. Moist will have to grapple with gallons of grease, goblins, a fat controller with a history of throwing employees down the stairs and some very angry dwarfs if he's going to stop it all going off the rails.